First Novels Club: Co-review of Susan Beth Pfeffer’s Last Survivors trilogy! Co-review of Susan Beth Pfeffer’s Last Survivors trilogy! When Sara and I read Susan Beth Pfeffer’s Last Survivors novels – Life As We Knew It, The Dead and the Gone, and This World We Live In – we knew we wanted to co-review the apocalyptic trilogy, because it’s just that awesome. The books center on one catastrophic event: An asteroid hits the moon, knocking it closer to Earth. The gravitational effects on the environment cause immense destruction and chaos, killing millions. In the trilogy, we see this through the eyes of two narrators – Miranda Evans and Alex Morales – as they and their families struggle to survive. 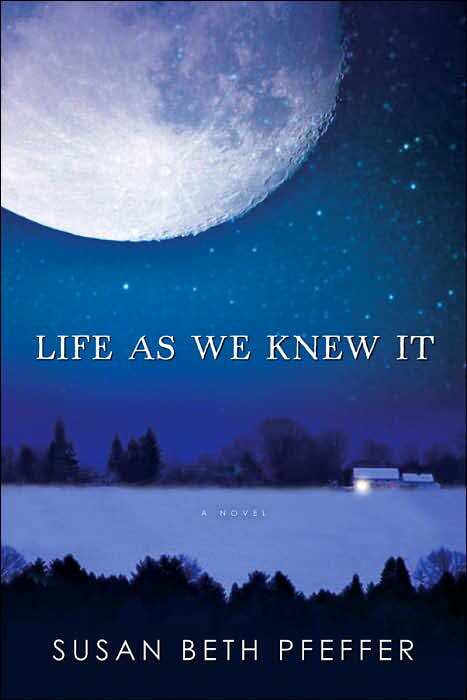 Donna – When I first told you that I was listening to Life As We Knew It on audio, I was SO EXCITED to hear that you were reading the Moon trilogy too! Sara – Yeah, technically it’s called the Last Survivors trilogy, but to me, it’s the Moon trilogy. And this series made me think of the moon in a completely different way. I love disaster movies, so I was really excited to read these books. But somehow—maybe it was because the book was in journal format, or maybe because I was reading it instead of watching it—the first book totally terrified me! D – I KNOW! Now every time there’s a huge full moon low in the sky I’m like, “Don’t come any closer or you’ll cause tidal waves and volcanoes and VERY BAD THINGS.” For whatever reason, more than a viral epidemic or a nuclear apocalypse, this moon thing creeped me out. I think it was the journal format, too —Miranda’s reactions felt so authentic. S – And I think because Miranda lives in rural Pennsylvania, and while we’re definitely not rural…the PA thing had some personal resonance. All I know is, after reading Life as We Knew It, I went out and stocked up on my canned goods. It was interesting to see how different people reacted to the catastrophic event—how for some, mob mentality took over, and that it really became survival of the smartest. D – Good point. Miranda’s mom was on top of things, which allowed her family to survive. But Pfeffer made their family to go through a ROUGH time. I mean, it was scary, and I really didn’t know what would happen next or who would live or die. And even though their lives didn’t consist of much more than rationing food and staying warm, the book kept me hooked with both internal and external tension. S – The pacing was really on in this book—I never felt like things dragged or that there wasn’t something lurking around the corner. And there was always was! It just seemed like things got worse and worse! And yet, Pfeffer manages to have an undercurrent of hope, even when it seems like all is lost. It might be because all the characters were willing to die to for each other, that you knew the whole family would sacrifice it all to keep just one of them alive. D – What could create better tension? People making heartbreaking choices about who should live or die — based on survival odds, logical calculations — gave the book such emotional power. It kept me guessing and on the edge of my seat until the end. S – I don’t know what I would’ve done if I had finished this book without knowing there was a sequel! 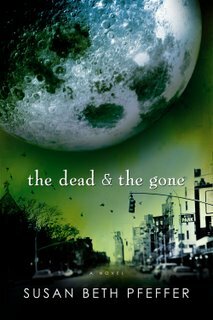 Although Pfeffer does make you wait—the second book, The Dead and the Gone, introduces us to Alex, who lives in New York City, and his experiences with the major moon event. I was excited to read this because that was one of the first questions I had when I read Life as We Knew It—what does it look like in other parts of the country? D – Yes! Especially since the first book mentioned New York multiple times via rumors and radio reports — that it was underwater, that everyone died — and after we saw a rural area post-moon-pocalypse, it was intrigued to see a major city, THE major city, handle the crisis. Alex definitely had different challenges than Miranda, and he experienced much more death and abandonment early on. S – Miranda’s entire world shut down so quickly, but so much of Alex’s kept going in some form—he kept going to school, kept going to church, and life really tried to go on. I feel like the big difference between Miranda and Alex is that for Miranda, there was just no turning back, and no way to convince herself otherwise, while for Alex, so much of the book was striving to return to normalcy—like finding his parents. S – I know! Which is creepy, because it makes you wonder, if you were in that situation, what would you do to survive? Also, can we talk about the Yankee stadium scene? Imagining that entire field, just piled and piled with bodies…ack! D – Gives me chills just thinking about it. The description of the rows of people, the smell — especially how methodical and orderly the process was to identify loved ones — all felt so real. I mean, it's probably because Pfeffer's a veteran author of over 75 books, but are we sure she never survived an apocalypse before? S – Seriously. I think there's something she’s not telling us. And I don’t want to give away the end of the book, but I will say it was equally horrifying and hopeful as the end to the first book. D – Agreed! Which leads us to the third book, This World We Live In, where Miranda’s and Alex’s worlds collide in Pennsylvania. We can’t talk too much about it because it will give spoilers to the ends of the first two! But I loved that we saw both main characters and their family members in new ways from their interactions with each other, because before we just had Miranda’s and Alex’s points of view. S – Yes. Plus, the disconcerting factor is upped by seeing what it looks like to stop trying to just not die and to start to make a new life for yourself. D – Suffice to say there were different challenges, more agonizing choices to be made, and a few new curveballs from Mother Nature to boot. S – I don’t know if I could have been one of the last survivors, but I really enjoyed reading about the people who could! D – One of the reasons we decided to co-review this trilogy was that, weeks after we both finished the books, we’d see a huge full moon and text each other with, “The moon! Oh no!” Now that’s how you know a book has stayed with you. But my stock of canned goods is pretty much nil. Good thing this is fiction, because I’d be a goner. Alright, people, your turn! Did you read the Moon (Last Survivors) trilogy? Is it on your TBR list? Don't they have the most gorgeous covers EVER? And most importantly, do you think you’d be a survivor, or a goner like us? Leave it in the comments! I just finished this series a few weeks ago and I loved it. It's so well written and freaky. I know Pfeffer says she's done, but I really hope she writes another one - the series doesn't feel finished. I loved the first two books of this series. Having to wait on the third - just did LA SCBWI - another book purchase just isn't in the budget. My daughter had to read the first as a class assignment and told me I totally had to read it. I read it in ONE SITTING - then I didn't sleep for two nights. DKB - Hahhaha love the pet food thing. The books totally make you think about craziness like that! Can't wait til you finish the trilogy!